Canada's gun lobby thinks the shootings in Moncton are evidence that Canada's gun laws are "excessive." The National Firearms Association (NFA) issued the following statement on Thursday. Canada's National Firearms Association expresses its sincere condolences to the families and friends of those killed, and to those injured in the terrible incident in Moncton, New Brunswick. The NFA deplores the terrible actions by a clearly deranged individual that led to these deaths and injuries. Incidents like these demonstrate the validity of the mounting evidence that none of Canada's firearms control efforts over the past 50 years have had any effect on preventing violence, or otherwise stopping bad people from carrying out their evil deeds. It is clear that Canada's excessive firearms control system has failed again. The excessive rules in place do not in any way increase public safety, but merely contribute to an expensive and unnecessary regime which harms only those of lawful intent. Resources wasted on this fundamentally flawed firearms control regime could be better placed to support a health care system which could be better enabled to diagnose and treat conditions that put people's lives at risk. The NFA seems to have adopted a very different strategy than the National Rifle Association in the United States. Immediately after mass shootings the NRA avoids making any statements regarding the legal status of guns. Instead the organization expresses sympathy for the family of the victims and says that now is not the time to discuss legislation. The NRA generally waits until after anger regarding a shooting dissipates before attacking gun control laws. This is the strategy the organization followed after the recent shootings near the University of California at Santa Barbara. It remains unclear whether the gunman who killed three RCMP officer on Wednesday and wounded two others acquired his guns legally. 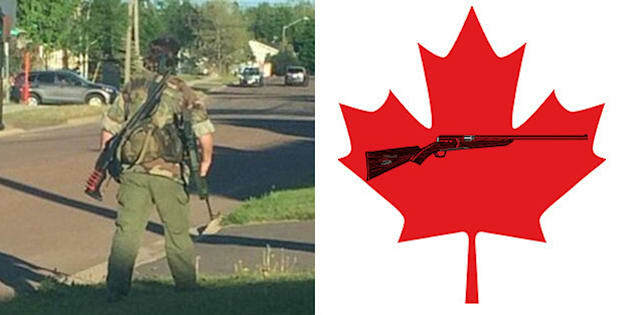 Photos of the shooter, who police have identified as Justin Bourque, show him carrying what appear to be an M-14 semi-automatic rifle (or possibly an M305) as well as a Mossberg 500 SPX 6-shot pump-action shotgun, according to Global News. Those weapons can be acquired legally in Canada and Global reported that as of mid 2012 the long-gun registry showed ten M-14 rifles registered in the Moncton area.